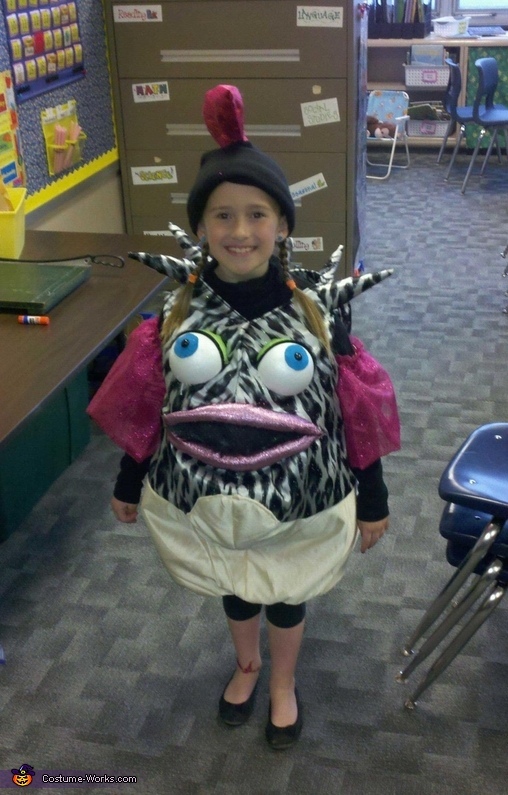 My daughter was selected to be a blowfish for her school play and it turned out so well we used it for Halloween. Most people didn't believe me when I told them I made it overnight, but that was all the time I had! Working full-time and school full-time didn't leave me much choice, but less than 24 hrs later this is what I accomplished! This was handmade with fabrics off the bargain rack at our local craft store. I had 15 minutes before they closed and these were just the fabrics I picked that I thought would work...and it turned out amazing! This is my favorite costume I have ever made! Very cute!!!! Hope u guys win! how did you make it puff out? and to hear you made it in night... WHAT? ?Way to go..
will you sale it? it is awesome! Thanks! Yes 1 very long night, but SO worth it! It's just stuffing ( lots of it) between the inside lining and the outside. Could you make one for my daughter in size 12? She is the blow fish in The Little Mermaid production in our town. The show is a very big deal here in small town NC. I would be glad to pay you. I need it by Oct. 4th. Thanks. Crystal, I need the boy version of this costume! My 4 year old is obsessed with pufferfish and really wants to be one for Halloween. Can you post instructions on how to make this or provide any guidance to an amateur costume maker? Any chance this is for sale? If so please email me at richardsonmelissa[at]yahoo.com. My daughter was assigned this part for a school play! are there directions you could share?